Scientists from the University of Groningen have succeeded in incorporating a light-controlled switch into a molecule used by bacteria for quorum sensing—a process by which bacteria communicate and subsequently control cellular processes. 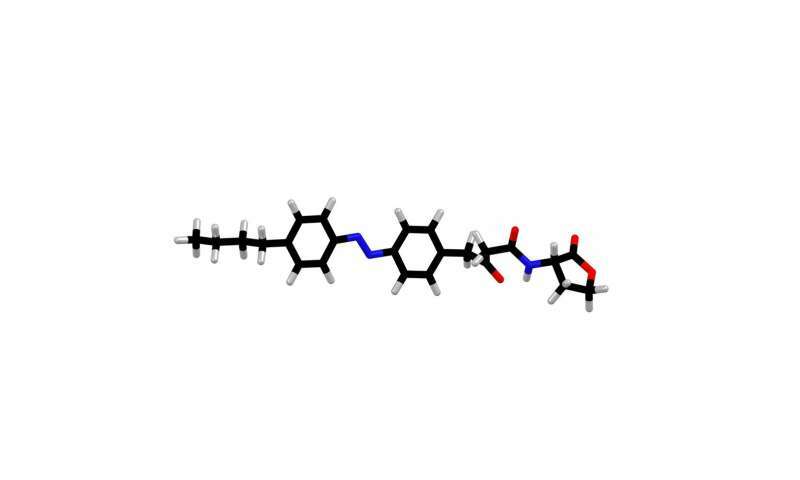 With the molecule described, it is possible to either inhibit or stimulate communication. This makes it a very useful tool for further research into bacterial communication and its influence on different genetic pathways. The results were published on 15 April in the journal Chem. In order to respond to their environment, bacteria communicate through a form of chemical signaling called quorum sensing. The cells secrete a signal molecule and at the same time, monitor its concentration. As more cells secrete the signal molecule, it can exceed a threshold concentration and activate certain genetic pathways, for example, to produce toxins or form a protective biofilm. "If we would be able to influence quorum sensing, we might be able to use it to treat serious infections," says University of Groningen organic chemist Mickel Hansen. "And it would also be useful to investigate how quorum sensing exactly works." To do this, it would be useful to have a modulator of quorum sensing that could be externally controlled. 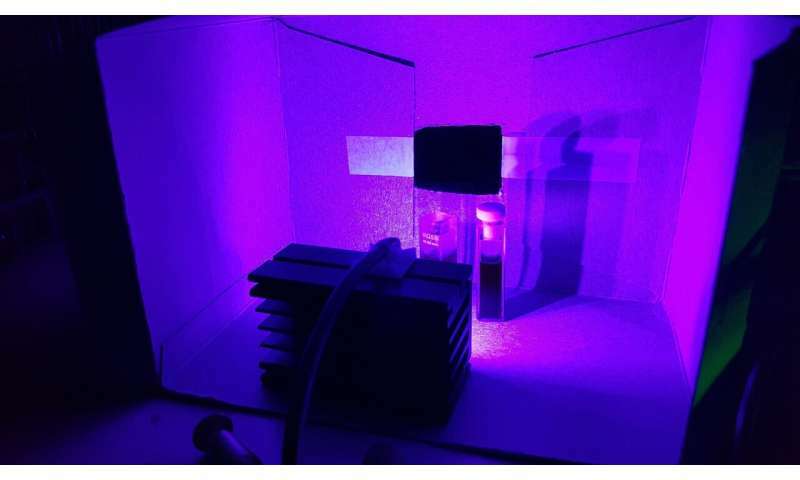 That is why Hansen and colleagues in the synthetic organic chemistry group led by Professor Ben Feringa set out to build a light-sensitive switch into a molecule used by bacteria as a signal for quorum sensing. The molecule is made up of a head and a flexible carbon-based tail connected via a β-keto-amide linker. The plan was to incorporate a switch into the tail. "This meant we had to connect the modified tail to the head via β-keto-amide linkage. However, the synthetic process to obtain this linkage produces a very unstable intermediate, which made it almost impossible to synthesize the molecule." Hansen, together with Master's student Jacques Hille, produced a library of 16 compounds that had the potential to act as agonists or antagonists of quorum sensing. All were fitted with a light-operated switch. All compounds were based on a molecule that is used in one particular quorum sensing system in Pseudomonas aeruginosa, which has about five of these quorum sensing systems. In collaboration with molecular biologists from the lab of Professor of Molecular Microbiology Arnold Driessen, also at the University of Groningen, the genes for one of these systems were transferred to an E. coli reporter strain, allowing any effect of the newly synthesized compounds to be tested without the interference of other quorum sensing mechanisms. Bioactivity tests on the compounds obtained showed which parts of the molecule were crucial to controlling quorum sensing. The optimum number of carbon atoms making up the tail appeared to be four. Flipping the switch with light caused the tail to bend. Remarkably, the straight tail had no effect, whereas the bent tail induced the quorum sensing signal. Hansen: "Overall, it appears that small changes in the molecule can have a large effect on its activity, but we don't yet know exactly why." They did find one compound that was able to strongly inhibit the quorum sensing signal and—after irradiation with light, leading to the bending of the tail—to also strongly stimulate it. The difference in activity was more than 700-fold, which is huge. "Such a large difference has, to our knowledge, never been shown before for light-switched bioactive molecules." This particular molecule will be a very useful tool for investigating how bacteria communicate. "In the study, we showed that we could light-control toxin production in a Pseudomonas strain with our switchable modulator. This will be a powerful tool for both clinical and fundamental research into the mechanism of quorum sensing."